Shaken or stirred? How about one of each? The eighth-annual Arizona Cocktail Weekend (AZCW) is ready to put on a can’t-miss lineup of cocktail concerts, competitions and more in Downtown Phoenix during the weekend of Feb. 16 to Feb. 18. On Sunday, Feb. 17 from 8 p.m. to 2 a.m., it’s the return of Top Bars showcasing pop-up versions of renowned lounges from around the state and beyond, all in one location (The Croft). Confirmed participants include Bar Swift (London), Bar X (SLC), Deadshot (Portland), Dr. Stravinsky (Barcelona, Spain), Golden Tiki (LV), Herbs & Rye (LV), Katana Kitten (NYC), Arnaud’s French 75 (NO), Nickel City (Austin), Navy Strength (Seattle), Occidental (Denver), Raised By Wolves (SD), The Clumsies (Athens, GA), Sparrow & Wolf (LV), Tommy’s (SF), Ghost Donkey (LV), Union Lodge No. 1 (Denver) and Williams & Graham (Denver), plus Arizona landmarks: Bitter & Twisted, Blue Hound Kitchen & Cocktails, Clever Koi, Cotton & Copper, Elvira’s, Hotel Congress, Pobrecito, The Breadfruit, The Brickyard, The Gladly and UnderTow. Pre-sale tickets are $40 plus tax/fees ($50 at the door), including cocktail samples. Lastly, on President’s Day, the Last Slinger Standing bartending competition will host top US Bartending Guild mixologists inside 7th and Union at Young’s Market Company. 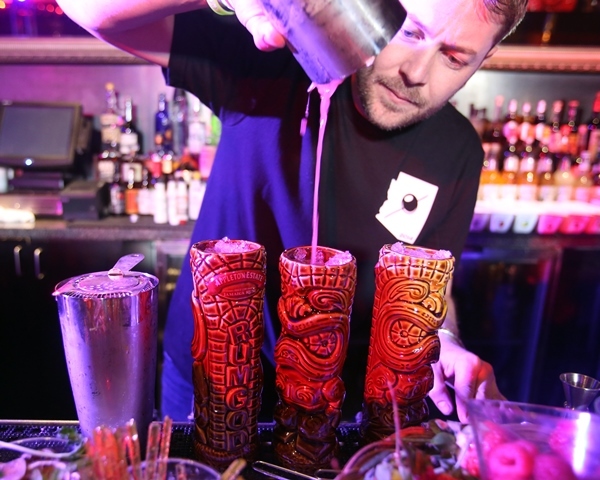 Come cheer on Arizona’s best (including 2018 champion Joshua James of Clever Koi, Fellow & Across The Pond) compete against the best bartenders from Colorado, Nevada, New Mexico and Utah. Free to attend, but RSVP is required. Doors open at 6:30 p.m. In addition, there will be dozens of informative seminars, exclusive tastings, festive pool parties and more. Namely, The Monkey Mixer, a full-sized concrete truck that was transformed into the World’s Largest Cocktail Shaker dispensing 2,400 gallons of Monkey Shoulder Blended Scotch Whisky, will return to AZCW.